- Introduce your self to our readers? I'm Saad Bin Mohammed, primarily a writer & partially a Painter. - What kind of arts do you produce? I mainly do old school painting/technique (usually oil on canvas) with ideas that I can't put in words as a writer, and each idea have one chance only to appear in a single painting. 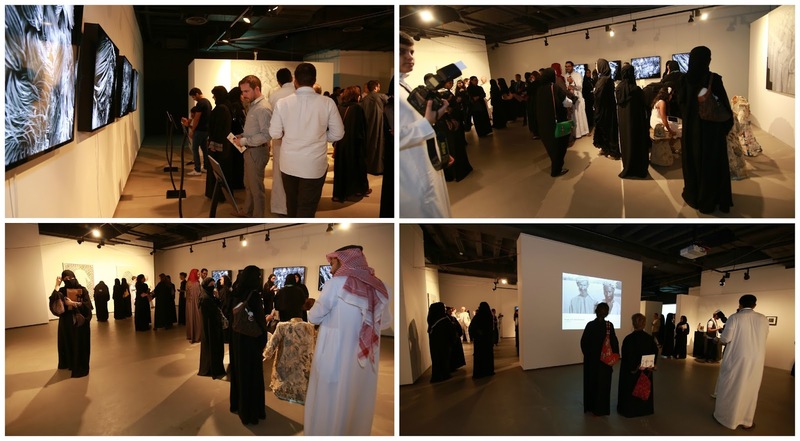 - What does your participation in this exhibition mean to you? It's a nice thing to be part of Lomar's 1st group exhibition. - How can our readers find you in the social media? I am an Art enthusiast .. A novice artist...Shapes, colors and lines fascinate me. After graduating university and starting a family, I spent my free time reading about painting and taking as much courses as I can learning to draw correctly and paint. Although I love oil painting, my first love is watercolor. For now, I work mainly with watercolors it has such a translucent, luminescence feel to it. 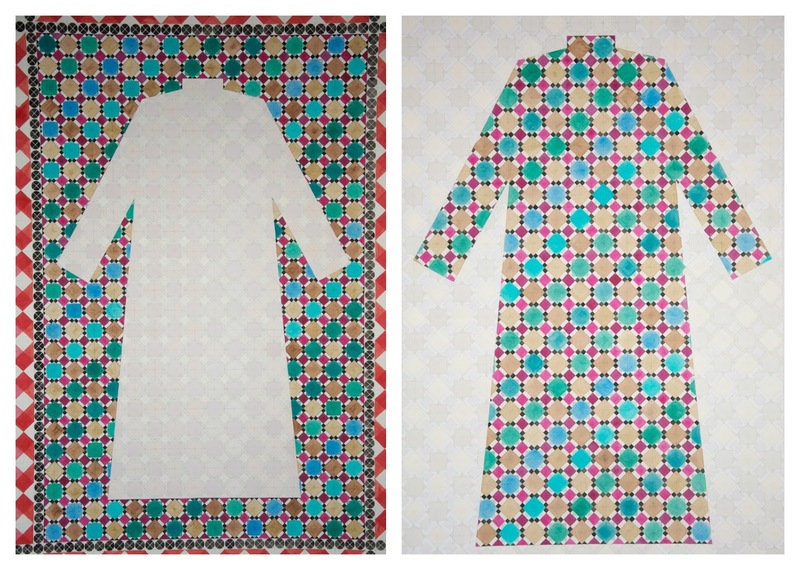 I compose Islamic geometry designs, then paint them using color schemes that are not necessary traditional. It has been such an exciting experience. Being chosen to participate is a huge joy, and having Onqoud curating the event made it such an easy process. 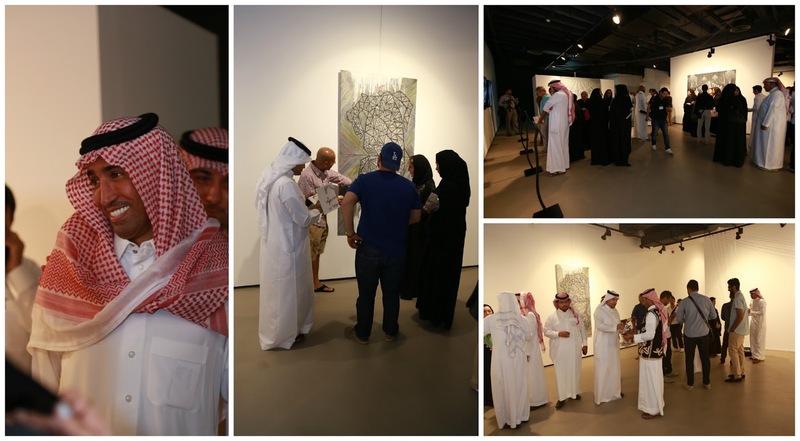 from left to right (by Artist Nouf Al-Semari, Heba Farahat, Khalid Oraij & Nawaf bin Saud). Usually I tend to to forget myself whenever am asked such question lol, but to be brief .. what I do in art is what I fell to say it right in words.. visual ideas are becoming part of who I am as a human before being anything else . its like thinking in colors. It means a lot indeed , the fact that am still overwhelmed by the opening day is another thing .. one of the best openings that I was part of in Saudi, and also being part of such project with such awesome people Onqoud, Lomar and Naila gallery and not to forget the beautiful group of artists that I was with .. a great day for sure and a great memory to have and share with lovely ladies like you also. I'm a global citizen that grew up in Saudi Arabia. Whenever I went to Egypt for summer vacation, my aunts made sure to buy me art supplies and take me to museums. I was very much blessed to be part of a family that had artists. I majored in graphic design and have been exploring the thin line between art and design since I graduated (2010). I wore many hats, from graphic designer to social media executive, but I always knew that my passion was in a different direction. In November 2012, we soft launched "Onqoud" at KAUST's Start-up showcase, I left my full-time job in January 2013, and have been dedicating my time to "Onqoud" ever since and I'm loving every minute! - How did you choose the artists? 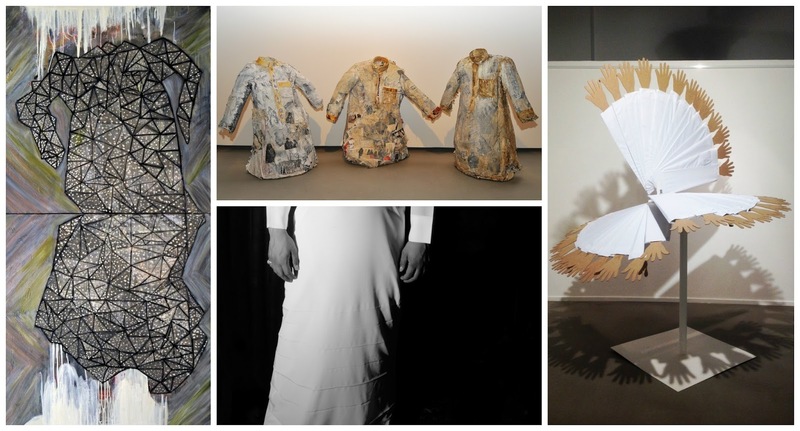 We went through a wide selection of Saudi contemporary artists that share a clear connection and attachment to the Saudi culture. 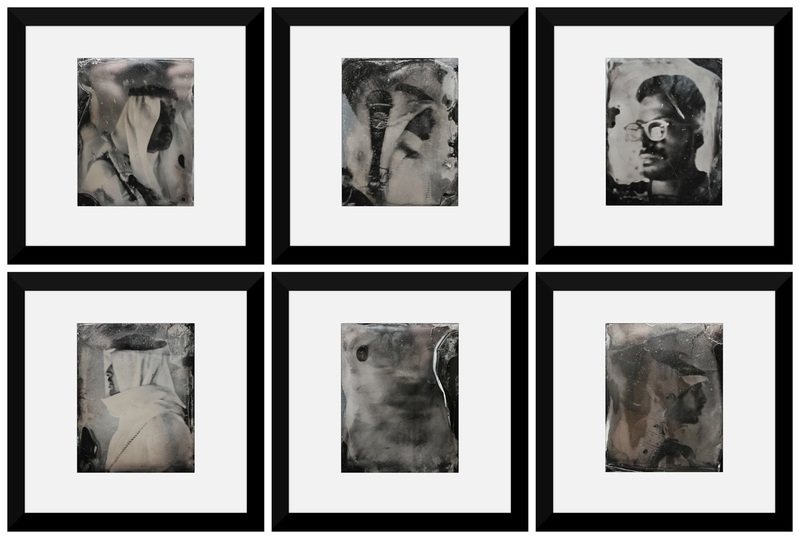 We selected artists that we knew would come up with work that was completely unexpected, and they definitely did! I am an independent experimental artist and most of my work is personal. However when I do exhibit, I prefer to create installations that engage visitors and allows them to be part of the creative process. I know the great feeling you get when you exhibit, and I want everyone to experience that! 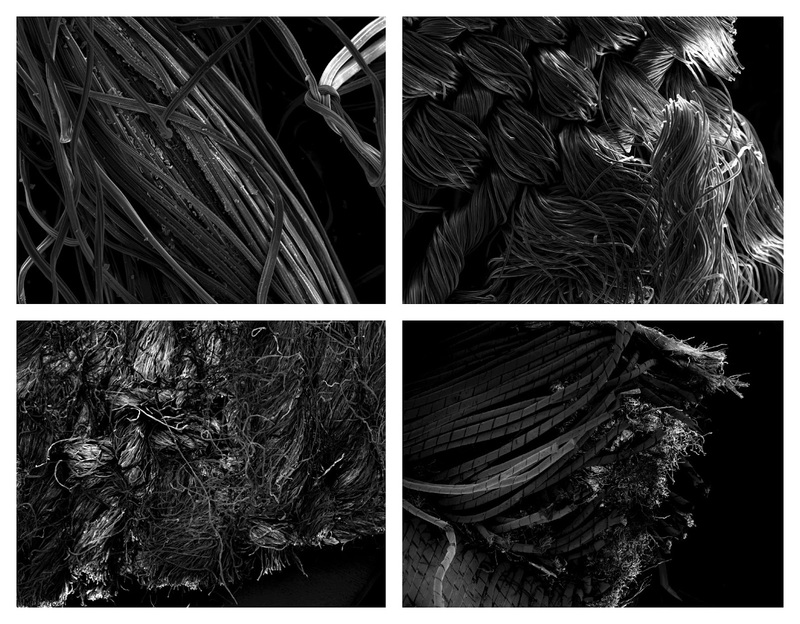 This project helped every single participating artist step out of their shell. This was the first time for me to work with a canvas this large (5 meters wide) and threads. The most challenging part was encouraging people to step out of their comfort zone and be the artists instead of the viewers. This installation is by everyone and for everyone! Galleries should not be for artists only. Everyone deserves to experience the feeling of having their work recognized and exhibited, at least once in their life! - Why did you choose Riyadh? although both Onqoud and Lomar are located in Jeddah? Both Lomar and "Onqoud" have teams in Riyadh and Jeddah, but mainly Jeddah. We started this project in Riyadh because we would like to further expand our networks in the region. - What should people expect to see in this exhibition? You should expect diversity, quality, and ingenuity! 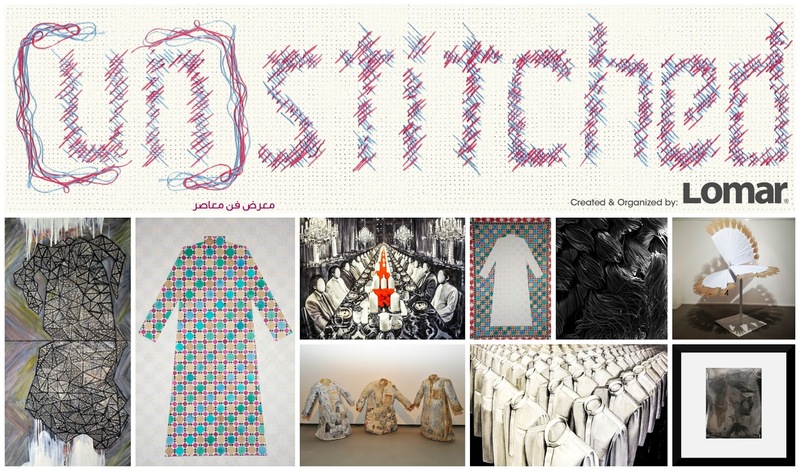 [UN]stitched was Opened on Sep 10th with Her Highness Princess Ameera Al-Tawil attending as an honorary guest along with others. The exhibition will continue until Sep 30th 2013 @GalleryNaila in Riyadh, Sat-Thu: 10am-10pm, Fri: 5pm-10pm for more info please click here.